We have returned from some time with our daughter and son-in-law in NJ. The highlight of the trip was the NY Sheep and Wool Festival. We got to pet the sheep and goats and alpacas but the lamas we admired from a distance (they spit). We beautiful yarns and knitted, crocheted and felted items. We enjoyed spending time with our friends who have moved to Saratoga from Germany. It was a good day. I have finished another quickest quick-step lap quilt. There is a panel at TN Quilts with cartoons about hunting and fishing. 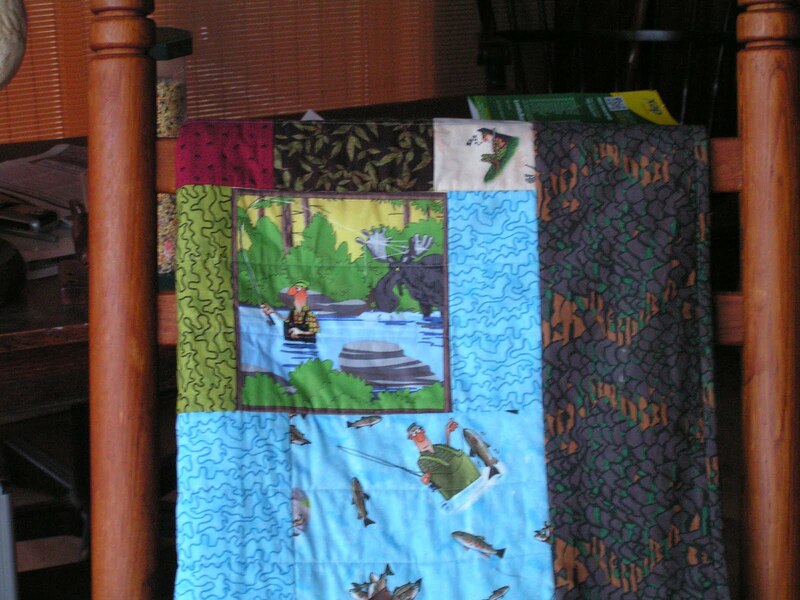 It tickled my fancy so had to use it in a quilt. I signed up for a newsletter from http://www.henrysfarm.com/ that is full of information and recipes using in season fruits, vegetables and herbs. We tried the Baked Green Tomatoes for supper this evening. The recipe is as follows: 1 cup seasoned bread crumbs, 1/4 cup extra virgin olive oil, 3T water, 3 cloves garlic, crushed, 2 T Parmesan cheese, freshly grated. This was all mixed in a bowl and set aside while preping the three green tomatoes, sliced 1/2 inch thick. Place tomato slices in a single layer on the baking sheet. Top each tomato slice with crumb mixture. Gake at 350 for 35 to 40 minutes, or until topping is light brown. I'm jealous that you still have green tomatoes. We had an early hard freeze last week that took virtually anything tender - and today it's to be in the 80's! Kansas weather - always unpredictable! mmmm...can't go wrong with green tomatoes!